Its trees you need really, when you think about it. 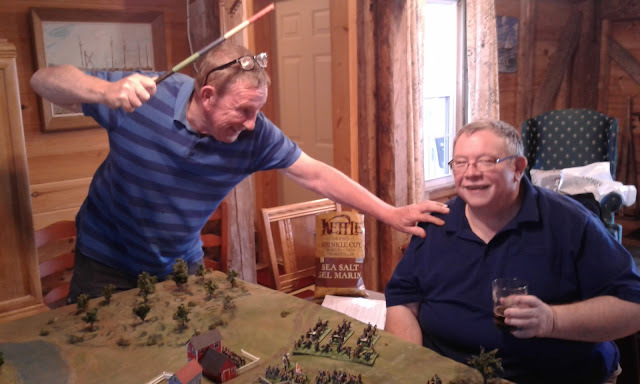 For Napoleonic wargames you need a Waterloo Farmhouse, for 18th and early 19th Century wargames set in Eastern Canada, you need trees. For a small battle you need at least one tree per soldier and twice that would be better. For a skirmish you ought to have three to five trees per model soldier. I'm nowhere close to even 1 per soldier for a skirmish. I need to at least double my collection of trees. For Lower Canada I really should add some White Birches and Maples too, and then have them in Autumn colours like I did for my 1997 Chateauguay game. I'm ok with going into winter quarters though and skipping the snow clad bare branch look. Anyway, enough troops have been shuffled back into their original 8 figure companies and based accordingly to have a small game. To save table space and headaches I've based them two figures per 30mmx30mm stand rather than individually on 25mm wide washers. Should have thought of that years ago. I'll still need some casualty caps but not as many as with the larger multi-figure stands. I've left the skirmisher only figures on washers though. Might be a few days before I get a chance to play but the table looks better than it did covered in heaps of old, leftover castings and spare bits, books, scribbled notes and the shambles of three armies being taken apart and reorganized. After a few false starts where I found myself subconsciously circling back to where I was, I spent a day or two rereading relevant bits of various memoirs and reviewing about a dozen small engagements or skirmishes. That got me back on track and made it clear that I was actually talking about MacDuff with "companies" as the basic units and scale of 1" to 10 yards and a figure scale of 1 figure to 10 men. (In otherwords, I reached the same conclusions as I did in 1998 and 2005). Two companies of the TBDth Infantry, with new red facings, a fresh coat of gloss and brand, spanking, new bases, assault a small settlement. In order to fit the figures into that figure/ground scale, and be stable, I have to mount them 2 to a 30mm wide base. Oddly enough, this is the same basing and organization I selected for my late 19th/early 20th century armies, albeit for different reasons. Having settled on scales and rules, I will be quite happy to violate the scales when converting historical actions into games for my collection. 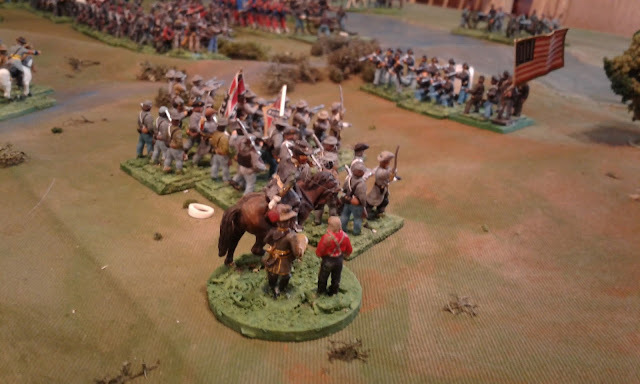 Some very small, but interesting, historical skirmishes, may be done 1:5 while most of the bigger battles along the Canadian border can be handled at 1:15. 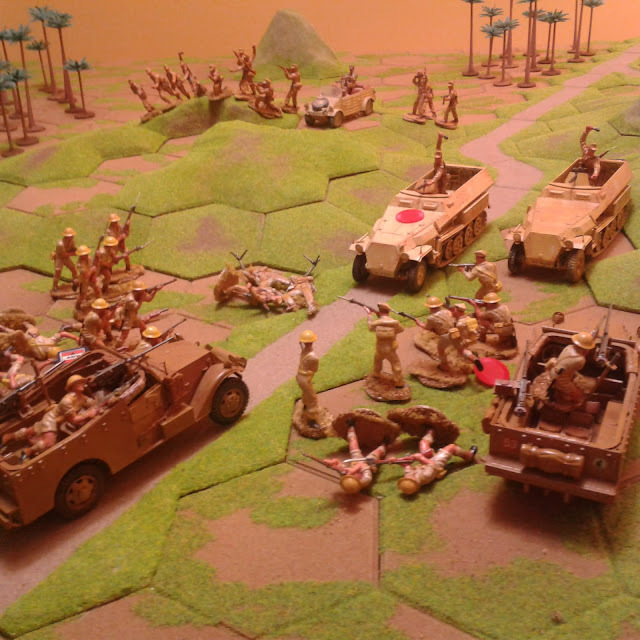 Its been a busy week but today I squeezed in a small Bolt Action game at Ron's, 54mm in Tunisia. My Recce patrol runs into a Jerry patrol in a pass through some rugged hills. It was a fun little game but I've rarely seen such a hard to read, poorly written set of rules that can require flipping through 2-4 sections in 2 books to find some very simple, basic, rules buried in a mass of trite trivial narrative in various places. It seems I have developed a preference for rule books that seek to explain how the rules work rather than trying to entertain. It was nip and tuck at times but while the Jerries poured in astounding quantities of very accurate fire, our blokes just wouldn't lie down and die. One of their 1/2 tracks did reverse off table at high speed shortly before the end though so I guess the Jerry mucky-mucks will know that we hold the pass. An update on the War of 1812 in a day or so. Strike while the Tin is hot! Isn't that what they say? Well, same thing but different as the idiom would have it. Anyway I have begun, and begun by resurrcting a dusty, abandoned and half forgotten project. Can't remember when I started this chap, might be over 10 years ago but I found the body and have resumed work. He now has a head with noticeable nose, a flintlock, etc but still needs a right foot and bit of general tidying up and finishing. 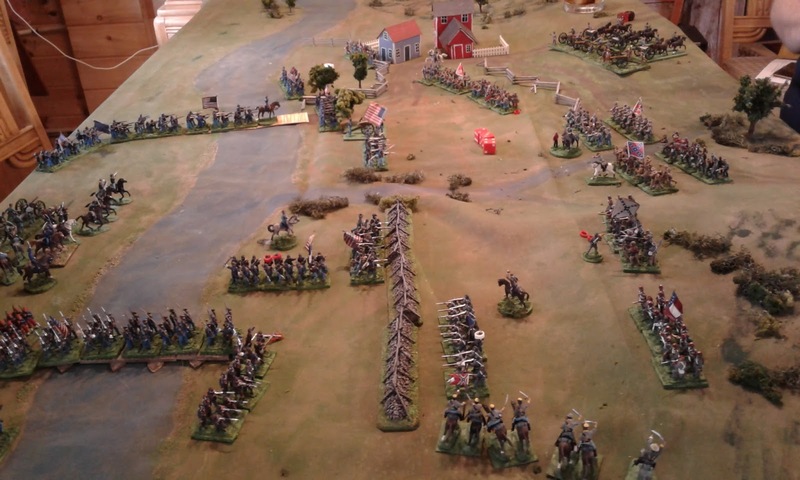 Since last summer, the remaining War of 1812 collection has been tagged to be reduced to a small, Battle in a Box, gridded game, but that wasn't where it started. 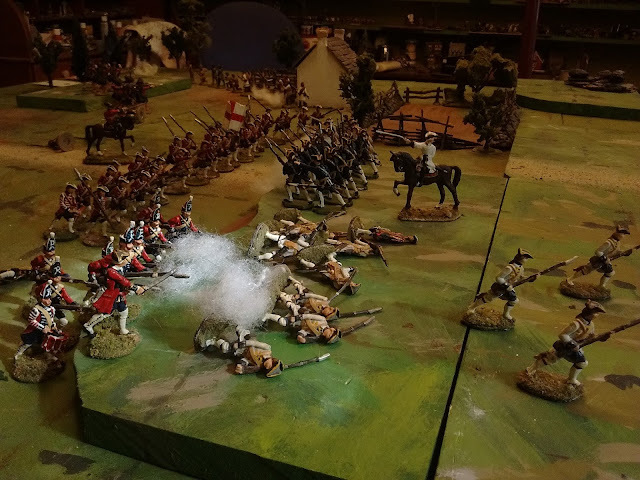 It was just over 20 years ago that I first dabbled my toes in 54mm gaming and my chosen subject was small actions of the War of 1812, initially centred on the Western campaigns. This was just before the deluge of new plastic soldiers for adults, so conversions were de rigueur. ( and also back to my roots!). 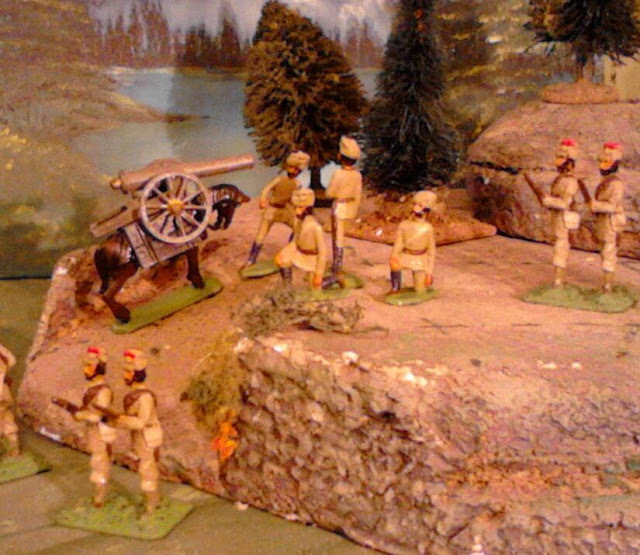 54mm Variations: L->R: Quebec Sedentary Militia, original Accurate ACW, US 1812. The outside fellows appeared at Chateauguay, Cold Wars 1998, the first public MacDuff game. The wargaming side of 54's got a big boost when Pete Panzeri put out a call on r.g.m.h. for 54mm figures that could be used in his La Haye Sainte game at Cold Wars 1997. My Marx Canadian (ie Mexican) Militia playing KGL manning the sandpit in the foreground, while beyond them, my US regulars, led by a Hoeffler General, are playing Belgians against battalions of their fellow BMC Mexicans used by Pete as French. So it was that about 100 of my 54mm British, Canadian and American troops played the role of KGL and Dutch-Belgians in public and I met new friends and enough 54mm enthusiasts to set me on my current path and eventually resulted in the Little Wars Yahoo group. It was also the weekend where I met Rob Dean and didn't close a deal on some original 1/32nd Airfix Russians, still in the box. (Still have them if anyone is interested.) It was of course Rob who later diverted me into 40mm and homecasting but that's another story. Tricky business trying to copy old glossy prints that weren't the best when new. A 54mm 1812 "get the convoy to the fort" game with Rob & sons en route to (or from?) Louisburg in 1999. This is the fort that was cut up to make the current Fort MacDuff. When I downsized to 40mm I initially stayed with low level actions with the occasional small battle. It was when I decided to re-home the chunkier, detailed half of my 1812 collection to focus on the smaller, shiny toy look and also came to the decision that I needed to cut back on periods and figures, that I decided that 1812 could be relegated to a portable, quick, battle-in-a-box. 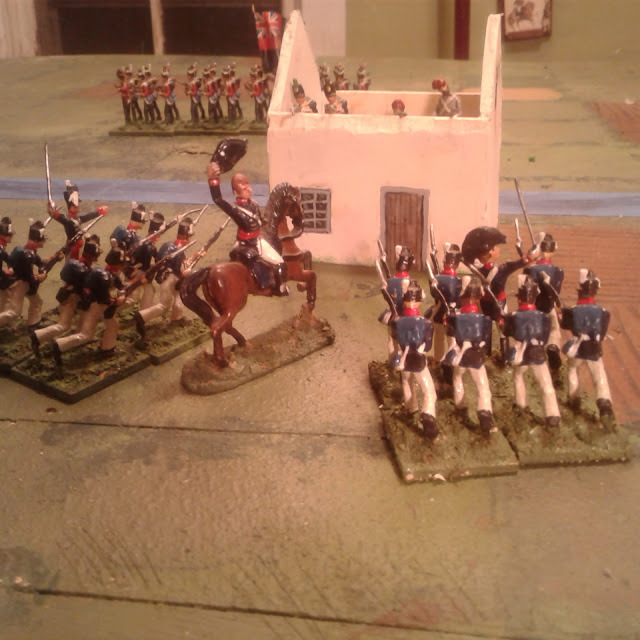 I wonder if I was just reluctant to resume painting 1812 figures? Luckily, just in time, along came various blog posts and videos that whetted my appetite to paint and field some tight packed battalions. My 18thC semi-flats would have served, but only if I dropped NQSYW conventions and tight based them en masse with 20ish man battalions. Putting all that out of my mind, I decided to start rehabiliting some 1812 troops who had been converted to 1839 uniforms. With that aim I went rifling through the spares boxes for some of the round hats and 1812 US shakos that I had made and cast in 1805. I found some, but also found a forgotten, unfinished, 1812 US infantry master. Hmm...just needs a head and some finishing up..hmm...I have a head....I also have a gallon of rtv on its way....shame not to use him.... and so it was that the decision was quickly but thoughtfully made to resurrect the original 1812 project aimed initially at the 1812/1813 raids, ambushes and small battles along the frontier from the Richelieu to to Lake Erie but with the option to expand into the 1814 and/or the western campaigns as well. After some deliberation and checking of table space, ranges and troop numbers versus various historical battles and skirmishes I have settled on a theoretical base scale of 1 inch to 20 yards (or 1 grid square = 80 yards) and 1 figure to 20 men. With a standard wargame line infantry battalion being 18 figures on a 6" frontage but possibly being 24 or 12 figures in some scenarios, and my grid being of 4" squares, it won't be a conventional gridded game after all. However, if I can't make the grid work for me for measuring at least, then I can always resort to my measuring sticks. The last two months have been a bit frustrating. Although I have managed a reasonable number of games and sorted a few things in my mind, I have been making very little progress on filling out orders of battle, writing up back stories or managing a mini-campaign or even a couple of battles in a row in the same war. There is a long, boring list of non-hobby related things that have interfered and the next 2 month aren't likely to be much better as I move farther into the fall/pre-winter outside Must-do list. Still, there is more to it and indecision as to which way to jump is playing a role. I think its time to have a look at what needs to be done, look at the issues and obstacles and decide on priorities and a plan. For those who'd like something more interesting that me waffling, here are some video's to watch. Brian's Toy Soldier Collecting blog has links to videos showing Britain's toy soldiers being made in 1949 and in 1965. After watching them, I found myself watching a 3 part Russian look into the history of toy soldiers (dubbed in English) that I had seen once sometime (years?) ago. WARNING: Watching this video left me with a burning desire to cast and paint more soldiers! A.Prince Micheal. The big thing here is to be ready to take an 8 player game to Huzzah in May. The three main things are: to settle the details of the scenario, assess the requirements for figures and terrain, and identify and rectify any deficiencies. I'm fairly confident that this only needs a week or three of winter leisure to polish up, mostly a matter of some basing and some paint enhancement on some second hand figures. B. NQSYW. I have a vague consensus with myself on organization and rules but all that needs to be sharpened. Then there are uniform decisions, decisions on refurbishing old units, back stories, and on and on. I don't want this to languish nor do I wish to rush it, especially not the wrong way. I think another game within the next few weeks then put it off till the weather turns cold and then see about ordering some new guns and settling down to planning followed by execution. C. War of 1812. This limited scope collection is bugging me because it is almost but not quite ready. It seems silly to start with the one that I am least likely to want to campaign in but it would be good to have a small, complete, Canadian history, 40mm, game, ready to go. All presentable and proper like. It also wouldn't take much. A few dozen existing figures to touch up or rebase, perhaps 50 or 60 new homecast figures, some finishing of bases. It would just seem smart to get it out of the way to reduce the clutter and distraction. D. The Great War. This has my eye at the moment and is really where I want to spend the most time next year but there is a lot of work to be done to get me to where I want to be and I don't want to rush into production until I know what I need. There is a need for several new figures to be sculpted and cast and there are some issues around obtaining artillery and mg's to be resolved which may mean finding either funding or a spark of cleverness, not to mention the need for mountains. In short there is a lot of planning and work to be done. I confess, this has been complicated and escalated by the possibility that if I arrange to have sufficient historical figures for an historical 1912 Caucasus game then I might be able to take said game to Huzzah should it happen that they decide that the 100th Anniversary of the last year of WWI would be a fitting theme. Not THAT important but it would be nice to be in step for once, well, sort of in step. Actually now that I have written it down. The 1812 stuff makes sense as it needs almost no planning, just doing. Planning on other things can theoretically proceed in the background. Could be brought home by Christmas if I settle to it. For a number of years now (too many) I have been slowly working towards reducing the numbers of armies and campaigns represented on my shelves in order to make time and space for the chosen few. 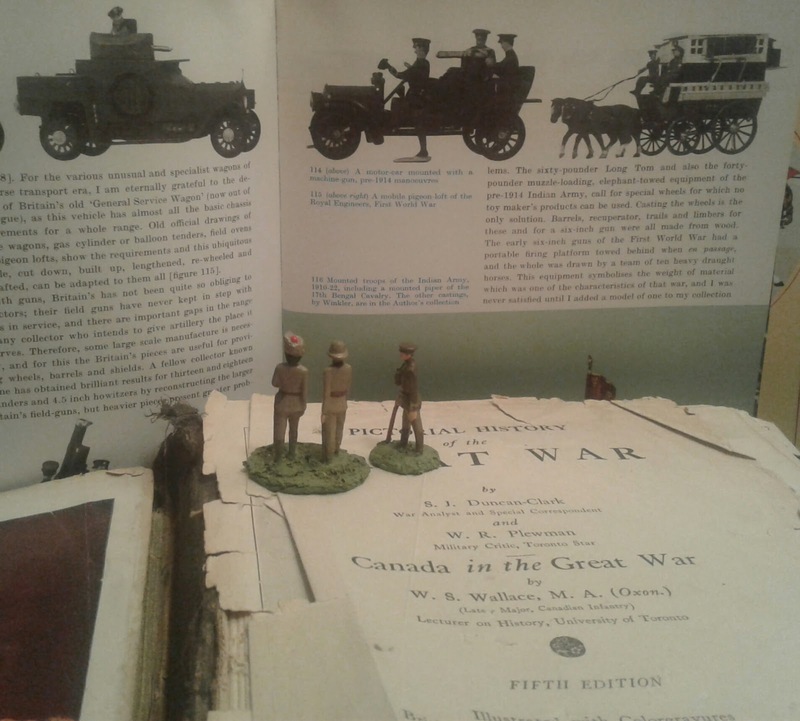 As part of this process, in 2014, I embarked on an entirely new collection (I know, I know), essentially a Centennial, Shiny, Homecast, Toy Soldier, Not Quite World War One (NQWW1). It got off to a great start but I soon found that I needed to make new masters and moulds to continue much farther but had run out of materials and budget. Instead of pushing ahead anyway and making do, I decided to switch focus to work on other things until I was ready. As I grew near to despairing that the time would ever come, things suddenly came together while I wasn't looking. I have new green stuff, I have a a gallon of good liquid rtv en route, I still have the desire and best of all, I have a plan! "The one on the left, I think." ... "Yes sir, just the thing we need!" The book they are looking at is Henry Harris's "Model Soldiers", my entry drug. The other was given to my mum by her dad, a reservist recalled to the RHA in 1914. Some young kid seems to have flipped through the pictures too often. Now, it pains me to say that part of the deal with myself is that I will drop various stalled or played out campaigns and collections and either reduce them to a small "game in a box" or re-purpose the figures even where this means stripping, re-converting and re-painting. It also means that once again, I will have to "correct" certain details of the fictional history of Northern Atlantica (the "Colonial" half) but that will be for a separate post. Suffice it to say that there are likely to be some sheep skin caps and maybe the occasional small turban, fez or other cap. Three years gone by and still not over the mountain yet! The sun rises over St. Margaret's Bay as the tide moves in. If I had swivelled 90 degrees, due south towards the narrow mouth of the bay, and if the world was flat, I could have taken a picture of Bermuda roughly 1,250 km away. Civil Wars in 1/72nd plastic became an accidental theme for the weekend as I broke open my Portable Russian Civil War carrying case. I do have my own rules but the portability just cried out for Bob Cordery's Portable Wargame. Red artillerymen await the order to open fire while the Generals breakfast together. 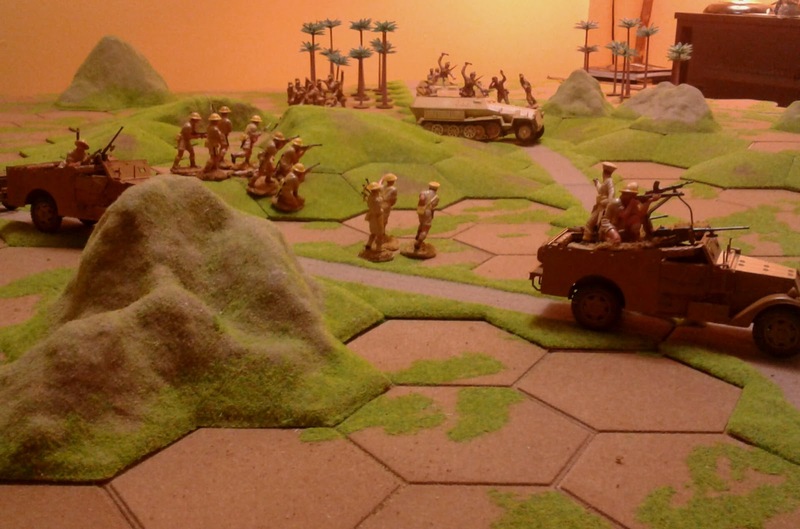 The basic playing field was a Hotz Desert Mat with 3" hexes and dabs and sprays of green paint. Having, somehow, not brought the log cabins for the scenario I planned to play, I just threw a low ridge line with scattered woods to one side and dealt out two balanced armies, each of 15 units plus a general, for an encounter game. Both sides would begin off table with the goal of seizing and holding the ridge. The exhaustion level was set to 8 for each side and simple elimination was agreed upon. All units were average. General with staff, 5 cavalry, 6 infantry, 2 field guns, 2 MG (one of White's being a Tchanka) and 1 machine gun armed Armoured Car or Light Tank. An insufficient number of limbers were treated as window dressing. I don't particularly like dice activation systems since there is no way to avoid the chance of infinite rolls of '1' in a row so we opted for the solo card draw. Not having brought 2 decks of cards we just extended the range to two higher and two lower and used the two Jokers. The first game saw 3 Red cards then a Joker, which allowed me to grab the ridge before Rob moved a finger. That was then followed by a seemingly endless stream of high Black cards interspersed with Jokers. At that point I suggest we ditch one of the Jokers since the pack was small and things went a bit more smoothly with me being able to get off a shot or two before the game ended. 8 vs 2 was the score in Rob's favour. Each coloured ring marks a lost unit from that army. In the background a hint of red marks what Rob later christened the 'Wood of Tears'. The day was young and the game fast so we reset and this time the cards behaved normally with occasional short runs but basically balanced. The game played out very differently with Rob's tank cutting a swathe through my left flank cavalry then running amok amongst my guns. Only the courage of the dedicated patriotic gunners which inspired them to keep retiring their guns rather than running saved the day. At last more Red Cavalry galloped up and finished off the isolated tank. Losses were fairly close at 6 a side until a dashing Red assault tipped them over the edge. 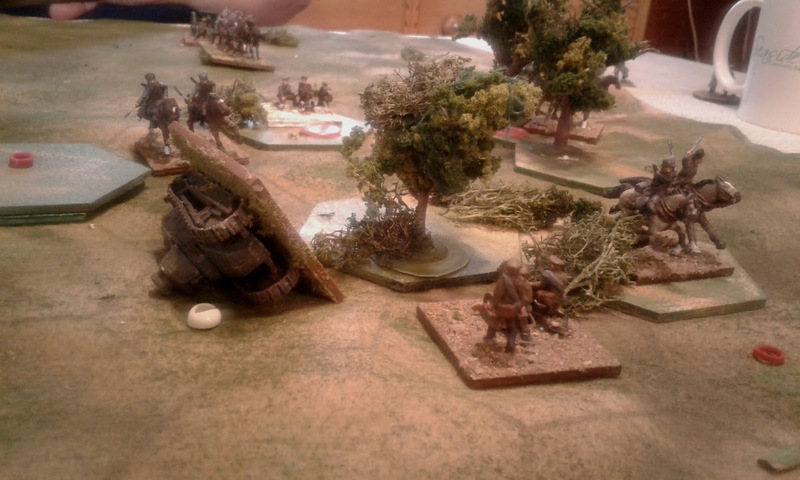 It didn't end the game though and has his shells crashed down on my troops I feared a draw but when counter battery fire, directed by General Ross himself, finally smashed the last White field gun, it was all over. They couldn't advance and were out of range of the ridge which I occupied. A narrow win but my one win of the weekend! Game 2. A Red victory! Urrah! At this point Paul stepped in as Red commander. Rob, already seasoned in the rules, handled him very roughly at start, aided by his ally, the sequence deck, but Paul doesn't give up easily nor do card runs last forever and soon the game was being very hotly contested. In the end Rob's third victory of the weekend was stoutly contested but a victory none the less. 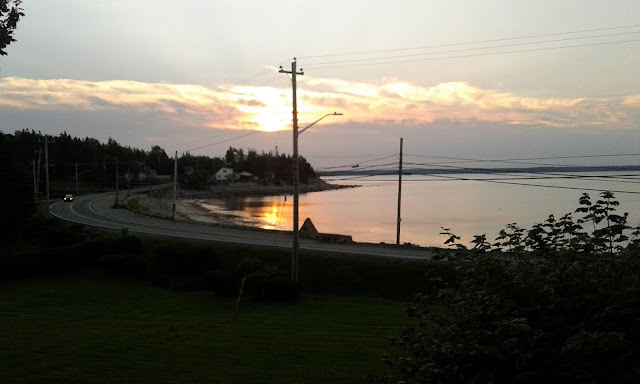 Earlier this week I made the trip due south to the Atlantic coast at St. Margaret's Bay for two days of jawing and gaming (etc...) with Rob (Captain's Bog) and Paul, two friends I first met and gamed with on my 3 month posting to HMCS Ottawa in 1977. 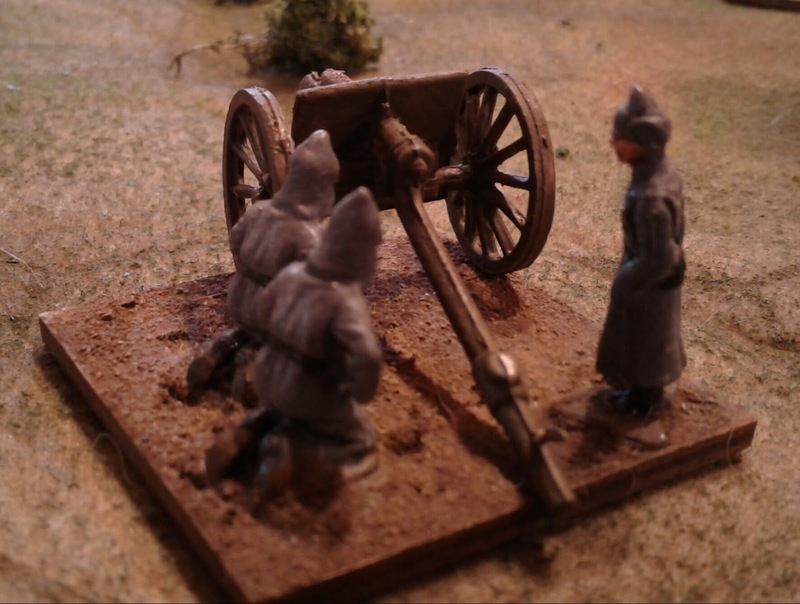 It seemed only right that I bring along my 20mm ACW since Rob was the friend who had passed me the accumulated hoard of ACW figures by several anonymous Halifax gamers which had been passed around in search of a home for who knows how long. The rules were a quickly drawn up non-gridded version of the last gridded ACW game I played. There were a few oopsies where I had missed something but over all I think it worked. A nice hexmat would have been good though. The scenario was .....'inspired by'.. or perhaps "a rough translation of" the Bridgehead Breakout from CS Grant's Scenarios for Wargames, using what I had to hand in my travel kit. By a non-coincidence, I have vague recollections of a multi-player 15mm original F&F version of the game at a Game Day at Dalhousie back in the early 90's which featured my and Rob's Confederates against Ron's Yankees (I think Doug Burrell and possibly others contributed troops as well, it was over 25 years ago!). The game begins with Rob launching a quick and unreasonably successful attack on a stone wall which had marked the Yankee front line. With all that settled the fighting began. Paul getting to grips with the measuring baton. Paul and I had a rough plan, Rob it would appear had a better one. In addition, the old Maxim held true that fortune favoured the bold. His weak left flank quickly attacked and hemmed in the right hand Yankee bridgehead. It took us the whole game to recover our start line. Charge after charge was thrown back by the Rebs but at last we managed to get enough troops over the bridge to drive off his cavalry wing, flank the infantry at the wall and slowly force them back. 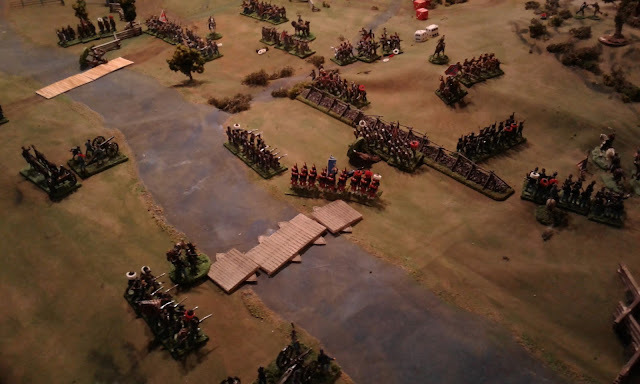 On the other flank Paul put up a stubborn fight but a grand battery on a hill managed to blow huge holes in the Blue line as a grey tide surged forward once and again, and again, until, after a desperate struggle, that bridgehead was crushed. Even Cesar's Zouaves were unable to take the wall after two bloody charges. At this point, my own personal figured had been lying wounded at the foot of the wall for some hours! By the very strictest letter of the victory condition we could have argued for a draw since we still held a portion of the bridgehead but since we had failed to take any of the high ground, had lost 1/2 of the bridgehead and one of the bridges and had suffered heavier losses, we readily awarded a victory to Rob. It was time for supper and a switch from wargaming as Paul's wife joined us so I will end here and leave the Portable Russian Civil Wargame for the next post. The following dispatch has been received from our correspondent on the North East Frontier. Brooklyn, 9 Sep 1867. On Friday, the 8th, I learned that General Milne was hastening to Whitebridge to oversee the recall of a substantial portion of Colonel Otter's Column from their posts along the Little Blue River and decided to accompany him to the front. There appeared to be little indication of Blue activity in the North East. The main army, including troops from both Oberhilse and her nominally independent ally Hougal, was reported to be gathering in the centre. The garrison in Whitebridge consisted of five companies of infantry drawn from the Belmont Rifles, Victoria Rifles and the York Volunteers, supported by one squadron of the Queen's Lancers and one from the Kapelle Mounted Rifles who had been sent back from the Oerberg Frontier as the threat of renewed war with Oberhilse grew. A train which was on its way to collect the infantry was rumoured to be carrying a Naval Landing party with one of the new Gatling Guns to reinforce the defences. The troops scheduled to rejoin the main army were already fallen in by the Station when the Blue guns suddenly galloped into sight, deployed, and opened fire. The red coated companies of the Belmont Rifles were already fallen in, waiting by the station, and the train was in view when Blue's advance elements appeared and a battery opened fire on the town. With great steadiness the Victoria's supported by the York Volunteers returned the enemy's fire. A courier soon arrived with an order for the Belmont's to commence boarding and depart as soon as possible. This order was greeted with a murmur of dismay but it was obeyed even though a second column of Blue troops had now appeared some distance south of the town. 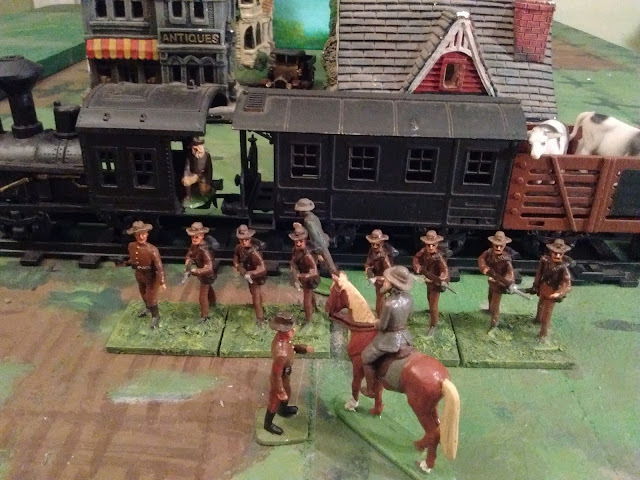 The Belmont Rifles depart to re-enforce the main army. While Blue's infantry kept up a hot fire on the town, the Blue Guards could be seen slogging across the ford and forming in the woods. At last the Guard Lancers, resplendent in their gold laced, blue hussar tunics and fur caps, emerged from the woods and trotted forward. 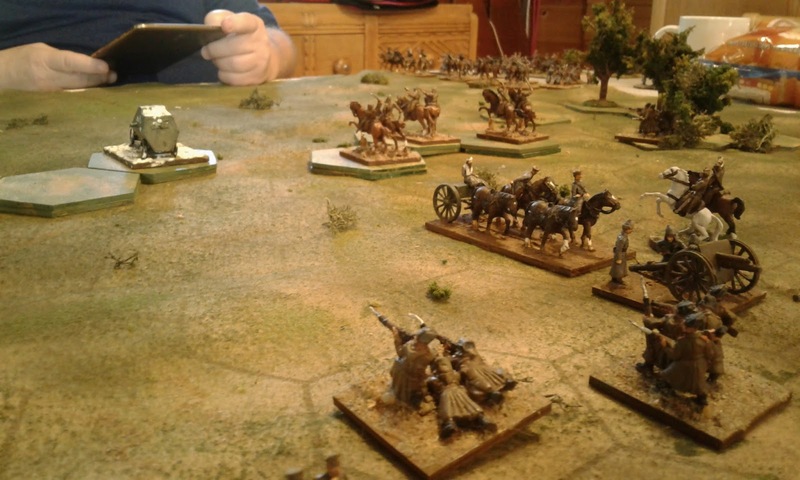 Lowering their lances, they charged forward, routing the Queen's Lancers and then driving back the Mounted Rifles. It was a magnificent spectacle despite the unfortunate defeat of our brave men. General Milne himself was forced to rally our horsemen in person while ordering the Gatling to deploy and cover the gap. Modern warfare, the Gatling routs a company of the Blue Guards. What a contrast in traditional and modern warfare. The age old clash of lance and sword followed by the chatter of the Gatling as it cut swathes through the ranks of the Blue Guards, driving them back in disorder. Stubborn fighting as Blue regroups and attacks again. The Blue Guards are not easily thwarted however and the attack was renewed time and again while only the intervention of General Milne at the head of the now dismounted Kappele Mounted Rifles saved the Gatling from a flanking attack from the Guard Lancers. As Blue's infantry was forced back all along the line, Blue's gunners took up the duel, forcing the Gatling to retire with heavy losses. Blue's General took advantage of this to finally launch his infantry over the bridge. If only the Gatling​ had been entrenched at the head of the bridge, how could any troops force the bridge against such firepower? Recognizing the value of the Gatling, and never forgetting the need for reinforcements for the main army, General Milne ordered the Gatling to fallback, escorted by the Mounted Rifles, and march to the main army. As the sun sinks, the fighting in the town rages. With the thinning of Red's ranks and the absence of the Gatling, Blue intensified their assaults on the town from both sides of the river. Again and again Blue was hurled back but eventually numbers told and house by house the Victoria's were forced out. Gathering the tired survivors, General Milne put himself at their head and led them forward with the bayonet in a desperate counter charge. Alas, a bullet found the brave General and those young Riflemen lifted him back onto his horse and retreated. 'B' company of the Victoria Rifles escorts the wounded General Milne to safety. So, in the end, the sun sank on a bloody and hard fought field as the dishearted young soldiers retreated carrying their brave leader while their comrades rushed sling the rails to join the main army and perhaps earn fresh laurels. Behind them the bloodied Blue soldiers regrouped and began to dig in. Was this attack a distraction or is this where the main thrust of a new offensive. SPECIAL EDITION! FIGHTING AT THE JUNCTION, PETITE COTE JUNCTION! OBERHILSE LAUNCHES PREEMPTIVE STRIKE . Word has been received from our correspondent accompanying the Blue River Frontier Force that earlier today elements of the Army of the Republic of Oberhilse launched an attack on Her Majesty's forces at the town of Whitebridge. The Belmont Rifles entrain with orders to rejoin the main army. Some times the dice just seem to pick favourites. But then sometimes a wargame General just seems to invite the Dice Gods to punish a poor plan. Trying to storm a town by rushing over a bridge was always going to be a risky undertaking but Red's rolling four 5's and 6's on 6 shooting dice against Blue's first attack, followed by 4 more on 4 melee dice on the next turn against the next unit was a hard start for poor Blue! This game was the Double Holding Action Scenario from Thomas's One Hour Wargame. It is (I think) the first time I have played this scenario. Red (the Royal Faraway Army), was tasked with holding the town and sending 1/2 of his force off table by road between turns 4 and 12. Blue ( the Army of the Republic of Oberhilse), had to either take the town or get 1/3 of his force off the same road exit by turn 15. Unbeknownst to Red, Blue's forces have found a ford. Turn 3 and Red has already starting moving units off table to reinforce the main army. 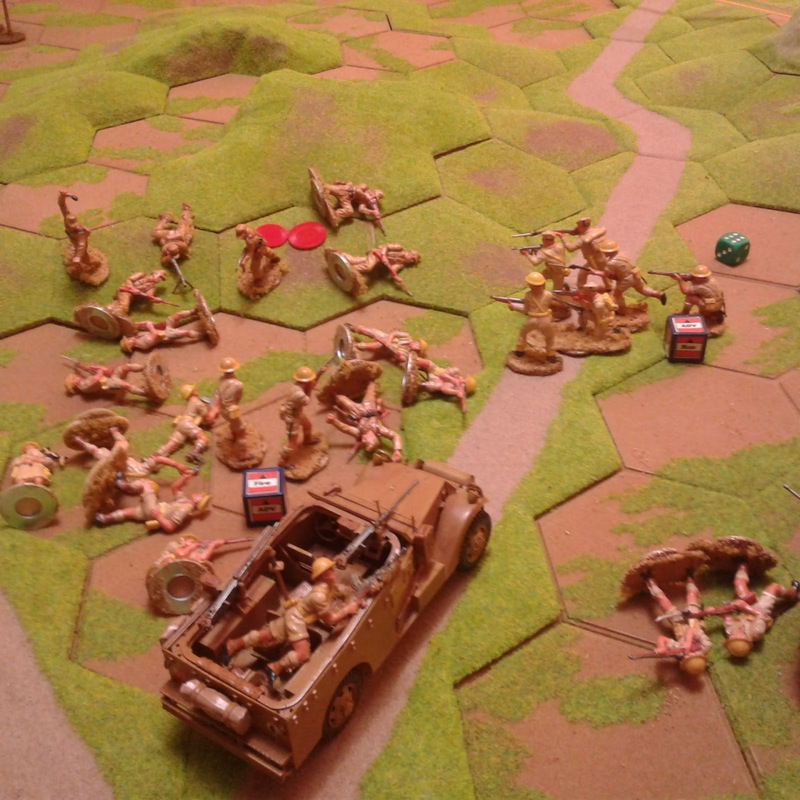 The game plan shifted to the alternate plan, block the road and/or sneak guys off, flank attack over the ford. By the time the force was across and in position to attack it was turn 12 and Red had already moved his units off table but not before Red's artillery routed a unit of Blue's Uhlans . 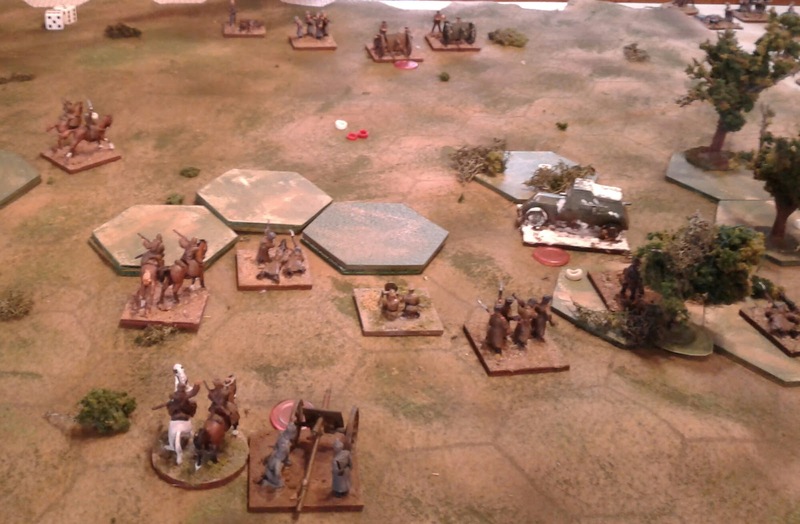 A gallant charge by Blue's Hussars wiped out two rifle units before proceeding off table towards the main army but that was it. With the best will in the world there were not enough units in position to exit. A pincer attack on the town was the last hope. A hope quickly withered by rifle fire with each pincer losing a unit for no gain. It was over. A clear Red victory after a bloody hour for Blue. Turn 14 of 15 and its over. Red has sent the requisite reinforcements off on schedule and still holds the town while only losing 2 out of 11 companies while Blue has only managed 1/4 of his requested reinforcements and no longer has time to fulfill either victory condition even Red wasn't there. There wasn't quite enough game to hang a good story on it but it was a fun hour none the less and I may well have another go in a few days whether with same or different forces or even a different period. It felt good to be back on the 4" grid with room to maneuver. The rules were a slightly updated version of my 2015, early 20thC, version of the Square Brigadier called The Tin Army. To a Tabletop near me. Sometimes any answer is better than none. At least I discovered what I meant in April about the 6" Grid having to go despite its good points! Here is the game laid out on the 6" grid with 4 stand infantry units and 2 single gun batteries sharing a square. If you look at the left hand side of the Union line, where it bends, you will see two of the issues. Firstly even with a weak defender there is no room for a proper outflanking move. Secondly the Blue unit on the brown field and the Grey unit on the hill are parallel and almost touching at the corner, in other words almost 1 beside the other but are able to blaze away at each other. Legal but looks wrong. The game was OK after I got the fiddling done to make it look and feel better and last a couple of hours. But I could have played the same game on my portable board with 1 stand units in an hour and it would have been as interesting or probably more since this took longer to accomplish less and still looked odd because of the large but shallow units and short ranges. After various failed experiments I allowed diagonal facing with a maximum of 1/2 the unit shooting out of each of the two faces. I also ended up using the Hearts of Tine combat mechanism with 4 hits per stand but without using the rally rules. In some cases my difficulties were largely visual or at least, the large grid and unit sizes made them more noticeable, while others were scale related. 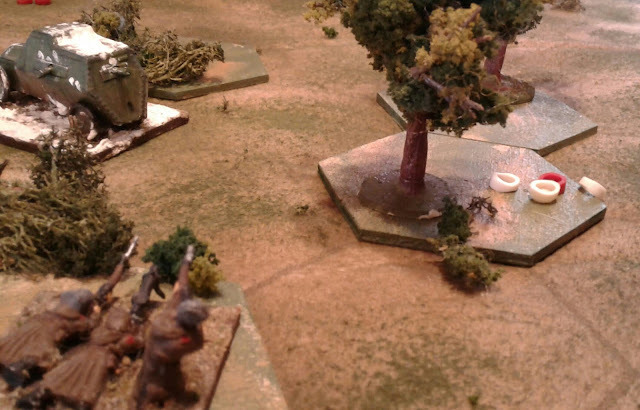 To make the game less of a Brigade skirmish I stuck with a 50 yards to the inch scale at 300 yds per square. This meant that virtually all infantry combat was between adjacent squares apart from the fire of skirmish screens. It also meant that single artillery batteries were an issue but forcing them to work as 2 battery Brigades would be a problem if doing an historical scenario. However, if the visual aspects of the game don't matter, why use miniatures? After various experiments I managed a vague special artillery stacking rule for massed or attached batteries and fiddled with the positioning of individual stands within the squares. Another small issue was more visual than actual. If you look at the next picture the white house in the lower left fills 1 quarter of a square. Should the square be open or is it all built up. I kept treating it one way for one unit but another way for another unit depending on where I actually placed the figures so had to rearrange the terrain midgame to make it more obvious to myself what sort of terrain it was. That should have been noticed and dealt with during set-up, probably by removing the house. The real deal breaker however, was the small number of grid squares. The table just didn't hold enough squares to field the force levels I wanted while still showing at least a little bit of the tactical feel and having room to manoeuvre. That was the point of the post just before I got wrapped up In Huzzah! last April. While the current table was fine for small quick actions I needed a bigger table for larger, longer actions or those with more manoeuvring. Since there is no room for a physically larger table I needed a larger virtual table. A table with more but smaller squares! I had hoped that the 3" would work but it only works for a small selection of my armies. The end of a long but not bad game, a narrow, skin of the teeth last turn minor victory for the Federal army. After a fair amount of pondering, especially about 4 inch hexes, I did a review of the forces that will be using the grid. It was a jolt if not quite a shock to realize that all of my armies whose units would not fit on a 4" grid have been redesignated as Non-Gridded for other reasons. After some careful checking, all of my grid friendly armies have units that will fit comfortably on a 4" grid. I still have work to do but the 4" grid has been restored once again and feels much better. So after an hour or so of dabbing paint, I am back to where I was several years ago with more than twice as many grid squares to manoeuvre on than I had this morning. (216 sq vs 96) Luckily, all my houses etc were designed to fit inside a 4" grid square, as were my 3 stand ACW units and my 4" wide Atlantica and War of 1812 units. A single 60mm wide stand of Toy Soldiers will also fit nicely. 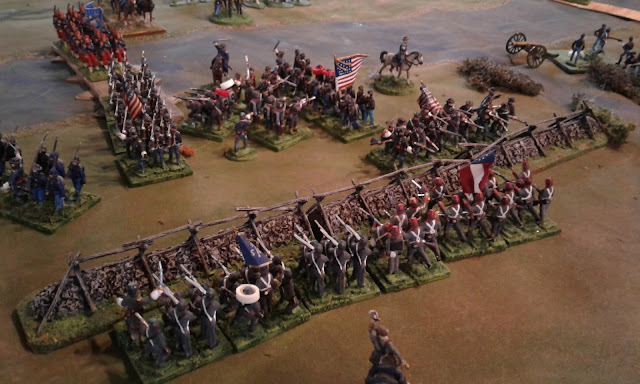 A little voice whispers that I really ought to play another ACW game for comparison but I have an urge to see Shiny Red Toy Soldiers in action.